Alt + `: Cycle through different aspect ratios and then when you have reached required, leave button A on your keyboard. 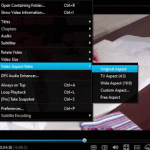 The Aspect Ratio available are 4:3, 16:9, 16:10, 1.85:1, 2.35:1 or Custom. 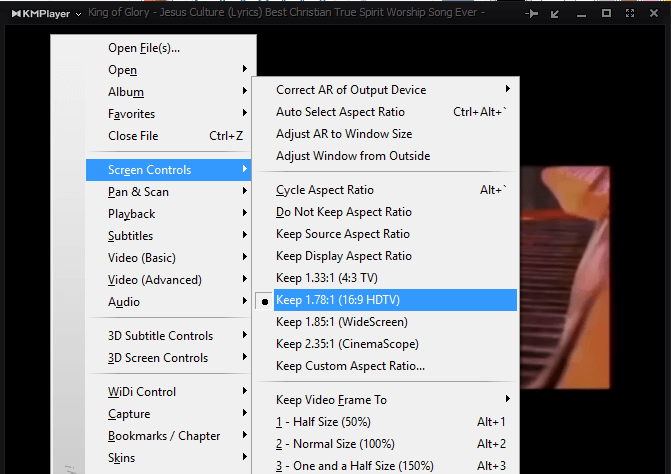 Right Click on the KMPlayer Window, Click on Screen controls and select 4:3, 16:9, 16:10, 1.85:1, 2.35:1 or Custom. 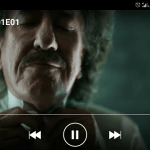 Hope with this, you have been able to change the aspect ratio available on the KMPlayer. 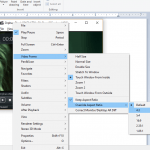 It seems that 4:3 ratio with PAL mpg is not correctly displayed, though 4:3 is selected. Same Video encoded in MP4 is correct, a little wider. 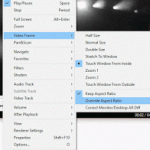 Windows media player shows correct ratio with both formats. I tried every menue item, but this wron ratio is still there.